Parent: The new school bus route is dangerous for Summerwind students! 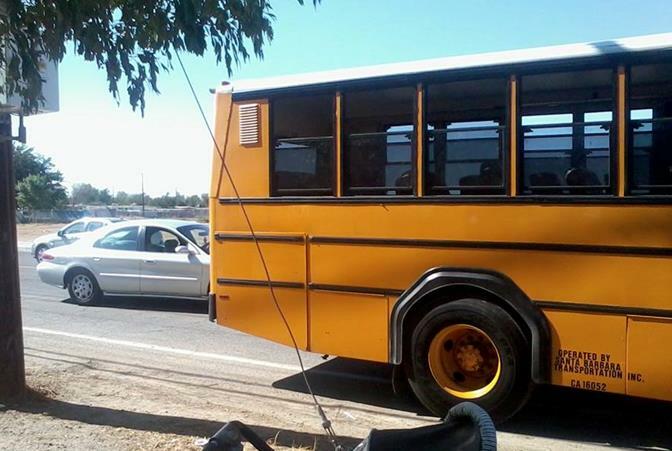 Palmdale resident and parent Toi-Riana Thompson snapped this photo Wednesday afternoon (Aug. 14), showing the school bus dropping off students at Avenue Q and 10th Street East. In the photo, a vehicle appears to be trying to drive around the school bus. Thompson believes the new bus route puts the elementary students in danger. My name is Toi-Riana Thompson and I’m contacting you to see if maybe you guys can help the students that go to Summerwind this year. Palmdale School District changed the bus route for the students and they didn’t inform the parents. The new bus route has the bus stopping right on the corner of 10th Street East and Avenue Q, where the bus driver has to stop traffic. It is dangerous because drivers sometimes get mad and want to go around the bus where there are kids walking. Yesterday (Aug. 13), we had an incident where a few of the kids were told to get off the bus on 9th and Avenue Q. They had to cross the street, and some of these kids are kindergarteners! They shouldn’t allow the kids off the bus unless the parents are there. Some of the kids informed the parents that the bus driver kicked the kids off the bus and informed them that she didn’t care if they got hit, she wanted them off. Some of the parents went down to the School District to get the bus route changed to what it has been for the pass 20-something years. I know getting this out there would help us parents get the word out to the District. As a parent with a child on that bus, I don’t want to see anything happen to these kids. I drop off and pick up my child from the bus and I keep an eye on the other kids to make sure nothing happens. However, it would be easier if they changed the bus route back to what it was before. On the old bus route, students were picked up and dropped off on 10th Street East and Avenue Q-5. The new bus route picks up and drops off students in front of a house on Avenue Q by 10th Street East. The pick-up time for the kids is about 8:23 a.m. and drop off-time is about 4:10 p.m.
Editor’s Note: The AV Times spoke with Palmdale School District Superintendent Roger Gallizzi on Thursday (Aug. 15). Gallizzi said school bus routes across the District have been changed to “save the tax payer money by eliminating redundant bus stops.” Gallizzi said there used to be lots of tiny bus routes, with students being picked up directly in front of their homes or apartment buildings. The changes were made to eliminate those bus stops that were too close together, Gallizzi said. A school bus stop at Avenue Q and 10th Street East does not create a safety hazard, Gallizzi said, because the law dictates that all surrounding vehicles must stop when a school bus is stopped with its red lights flashing. 28 comments for "Parent: The new school bus route is dangerous for Summerwind students!" How fortunate that your child gets delivered to you on a bus, most kids have to walk. Also, I seriously doubt a bus drive told the kids they didn’t care if they got hit. Talk to the bus company about having the driver get out and stop traffic with their stop sign until all kids have crossed the street, I have seen them do this. We as drivers get frustrated with the bus routes, I for one always stop and obey the laws, kids lives are at stake, but when they keep the red lights flashing and you can’t proceed and there is NO kids visible, all gone this is frustrating. Parents need to get out of their cars, walk to the side of the road that the kids will be dropped off on, and then walk the kids to their cars. Don’t sit and watch. Hold up traffic is necessary to make sure the kids get across the street safely. Especially if they are in kindergarten. Or go to the school and get them yourselves…. I have to drive by 2 elementary schools 2x daily and am amazed at the way the parents drive, park, just run across the streets. Always wonder why they don’t have the motorcycle cops rotate thru the different schools & start writing tickets. The one school is at J-8 & 12th West. Drivers always use the center turn lane to drive & pass others, heading west on J-8 the fly thru the bike lane to 15th W which is really dangerous since there is now sidewalk so parents with strollers or other kids on bikes are in this lane. They will just hang a U-turn anywhere in front on anyone. Over by Gadsden the parents will stop anywhere including in front of fire hydrants, on corners and even double park. These are narrow older streets and they way they park cars can not get up & down the street or turn the corners. Parents who have just dropped off their children at school are the worst offenders of traffic laws. Yacking on cell phones, speeding, illegal U turns, you name it. Put a couple of motor cops near any school on any school day and writing tickets will be like shooting fish in a barrel. Right on! Time to put these drivers in check! I wish it was that easy to get a motor-cop I the neighborhood. 27th West is a nightmare when the middle school gets out @ Ave J. 27th W on the northside of J has cars lining both sides of NO STOPPING AT ANY TIME. Parents speed around that neighborhood, u turn when it is dangerous. They park in driveways and block others. They don’t bother stopping at the stop signs, unless they are really stopping right there, in the middle of the street and expect everyone to go around them. No eye contact, no wave and no middle finger! Bring on the motor cycle cops or cops on foot. Station them at the problem intersections. Not IN the street, someone would hit them! Gallizzi has and always will do whatever he wants, nothing has changed and it won’t because he can! He has a Board that allows him to make the decisions regardless of the aftermath. Welcome to the Palmdale School District…the greatest place on earth! The superintendent use to a teacher at my elementary school when I was little and he was a horrible, lazy teacher. He never cared about his students and when he was teaching the special Ed classes, it was even worst. I use to be a student volunteer for the younger grades so I’d usually be in one of his classes and saw this first hand. Can’t believe he made it to superintendent. Glad my kids aren’t in the PSD. Well Mr. Gallizzi, as you can see from the posted picture, not everybody obeys the traffic laws! (See car going around the school bus on a one lane road.) Now doesn’t your comment sound totally silly? How about contracting for a Palmdale Sheriff to park there and ticket these idiots that are in too big of a hurry so that a child doesn’t have to die or be gravely hurt before something is done about it?!! Sheesh! Do you REALLY believe the stuff that you say sometimes? My biggest pet peeve and I see it all the time,is parent drivers make illegal turns across all lanes of traffic to make a u-turn. Not only is this dangerous to others but they aren’t showing their kids proper driving habits either. They also yell at you like you’re at fault. Wish I the right to issue tickets,one for stupidity and another one for breaking the law. Hefty fine for both. All this attention to the bus route because it changed? That’s ridiculous. Get with it and go the extra few blocks and pickup your kids. You, as parents, know the schedule. You as parents, need to be waiting for your kids and if you see cars speeding by and/or passing the bus while the lights are flashing…report them. You need to stop complaining and consider yourself lucky that you have a bus that picks up and delivers your kids. It’s a matter of safety, not laziness. And honestly, if something horrible were to happen to a child, my first instinct would be to help the child, not go chasing down the idiot who did it and risk further lives. Of course you would help the child. In the meantime, report the abusers. No one said anything about chasing anyone down and risking lives. Way to spin it. They won’t change the route. Because failure to yield to a stopped school bus is an automatic $600 fine. It’s going to be a $$ generator for the county. Bet you see cops hanging out there in a week or so. I sure hope so! Because sometimes you have to hit people in their pocketbooks to get them to wake up and use the brain the good Lord gave them!! Oh yeah because everybody follows the laws! What a joke.. ! Just because the law says that the cars must stop for the bus does not mean that they do. The superintendent obviously does not have the safety of the children in hits heart. But I bet if it was his child or grandchild he would have a change of heart. And since when does saving money take priority over a Childs safety. I was on 30th st. W and I stopped behind two cars that were behind a school bus emptying students. The two cars went around the bus with no regard for the children. Next time I see this I will take pictures of the drivers. I also want to say that a bus on the lane beside the sidewalk nearly side swiped me twice and then nearly hit me as he/she was making a right turn. These drivers don’t seem to know how to handle that big bus. School buses should have cameras for everyone’s protection. The students, bus driver and passing cars. If passing cars choose not to stop, it’s on camera. Whether a bus route changes or not doesn’t give drivers the permission to race around them. The law is the law. If kids are acting up on the bus, the bus driver should radio the school that they are coming back to drop the trouble makers off. Yes! In San Francisco, the busses have cameras and can report drivers with photo evidence who drive in bus lanes. It would behoove STA to implement this same technology in school busses because then people would actually stop! How horrible! If the school isn’t going to change the route back, than they should at least have a cop there to ticket people who do not stop for busses. We’re having the same issue at Quartz Hill Elementary. Not with a school bus issue just with parking and the children’s safety in general. Everyone is walking from all different directions and cars from 50th ave has no concern and everyone is driving like idiots. I’m scared for everyone’s safety. I’d like to see the sheriffs dept. come ticket all the lazy parents who double park as well. Call a meeting at the school of all the parents and teachers and take a petition to the City and police dept. Until you can get some results a legitimate crossing guard should be hired. Good luck! Great article and as a parent myself I completely understand the concern. In regards to the superintendent’s response, yes the law prohibits people from driving down the road when a bus is stopped. The law also states people should not speed, must use turning signals, and that people should stop at red lights. But does this happen, yes. It’s better to use every precaution possible. Yes, you’re saving tax payers money but in the long run IF someone were to get injured I would feel horrible knowing someone saw this as problematic and could have been altered to better suit the kids safety. I have to agree with the previous response. The law means nothing to some people! I can’t believe the superintendent would even response this way. This is what’s wrong with the schools. I sure hope nothing happens and his statement comes back to bite him in the rear! I have reported to the sheriff’s department on numerous occasions where I was almost hit in the crosswalk, walking to pick up my granddaughter at school. One incident was a parent, AT that school. I let her have it as well as asking the principal to talk to the parent. Which she did, props to her for doing that and going the extra length to keep her kids safe. The majority of the Palmdale School District school board is up for reelection this November, and it is the board that’s kept the superintendent in office this long. I’d urge all PSD parents to take a hard close look at the lack of regard the superintendent has displayed for the schools and the community he was hired to serve when deciding for whom to vote this fall. His response in this instance is just the latest example of his arrogance and contempt for Palmdale. Amen to that. Time to clean house. They don’t speak for us! I went to a Board meeting not too long ago and Corrales was rude and disrespectful to teachers at the Board Meeting. She was rude to parents when they spoke. This is what upset me, a child got up to address the Board and Gallizzi did not even look up at the child, the whole time the child was speaking. He was looking down and writing something while the child was addressing them all. How disrespectful. Vote in November get these people out. If the Superintendent acts like an elitist, let him be Superintendent of a rich school district.